Azabu Kawagoeya is a carlings store with time-proven professional skills. Our motto is to make the best use of natural flavor to produce healthy and delicious soybeans confections that have been receiving favorable responses from media. 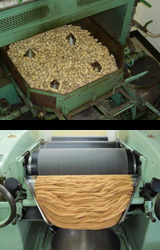 Azabu Kawagoeya produces and sells bean products, such as confections and ice creams made from soybeans and/or peanuts. Kiyozaburo started our business in 1889 after leaning carling techniques from Mr. Kamekichi Otaka, a leading authority on carling business. 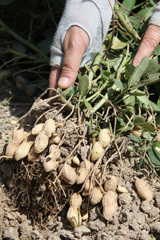 Keeping inherited technique, we are producing safe, healthy and delicious products with well-selected soybeans and peanuts. Among our lineups, peanut products are especially popular and have been introduced by several media. Please try our traditional taste. 2. We use soybeans of good quality, Furisode soybeans and/or good black soybeans from Hokkaido Prefecture. 3. We use other ingredients produced domestically, such as sugar and honey. Roasted peanuts have a lot of regular customers and are enjoying high popularity after the launch. We purchase han-dachi peanuts produced by contract farmers in Chiba Prefecture and the peanuts are further selected by our president with strict eyes. It could be a case that we refrain from selling products in July-September peanuts are easy to get oxidized. We do not use any seasoning and just rely on our experienced roast technique and quality of peanuts themselves. We are proud that we deliver the best roasted peanuts to our customers. 1. We roast peanuts with far infrared, by small portion that make us close observation. 2. We use black granite roller to make the Peanuts Paste so that heats that badly affects to flavor and nutrients can be absorbed by granite. Our roast technique that inherited from the originator is our treasure. We roast peanuts by small portions that enable us to deliver best flavor to our customers. The quality of peanuts could vary by year, but we can know how the peanuts of the year are and make appropriate roast. Our roast technique is not disclosed and is based on long tern experience. We will continue to keep our inherited techniques from the originator. Since the launch in early 1990s, our original product, Peanuts Paste, has been increasing its sales. The Peanuts Paste was developed to meet our customers’ needs for “paste that have original taste of peanuts, not the taste of syrup or flavorings”. By using black granite roller, we produce smooth paste with rich flavor. The Peanuts Paste matches with wide range of foods, such as bread, noodle, beverages. Although sticking to taste sometimes makes it difficult to purchase ingredients or to expand production, we will stick to our taste for our customers. Valuing our traditional taste, we are motivated to develop new products. We continue to deliver our value-added products across the borders. We like Azabu Kawagoeya’s roasted peanuts as it taste very good and without additional seasonings such as salt. Also, we introduced the Peanuts Paste from our friend and found it also delicious. We did not know the brand, but we look forward to try other products. Peanuts Karinto taste very good as it has flavor of peanuts and we also like its crispy texture. Please let us place an order for additional 10 packages. We wonder if the taste of the Peanuts Paste is different from that we previously bought. Thank you very much for buying our product. Our sugar-free Peanuts Paste uses natural crops and that causes slight difference year by year, or by farm. Sugar-added Peanuts Paste would not differ as it includes other ingredients. Peanuts Paste was sold out at the department store where we usually buy it. Do you receiving too much order? Our Peanuts Paste uses natural crops, peanuts from Chiba Prefecture, and the quality could slightly different due to weather conditions. Since we only use peanuts of good quality, production level could be low. Please understand that we put priority on quality. Copyright Azabu kawagoeya co., Ltd.